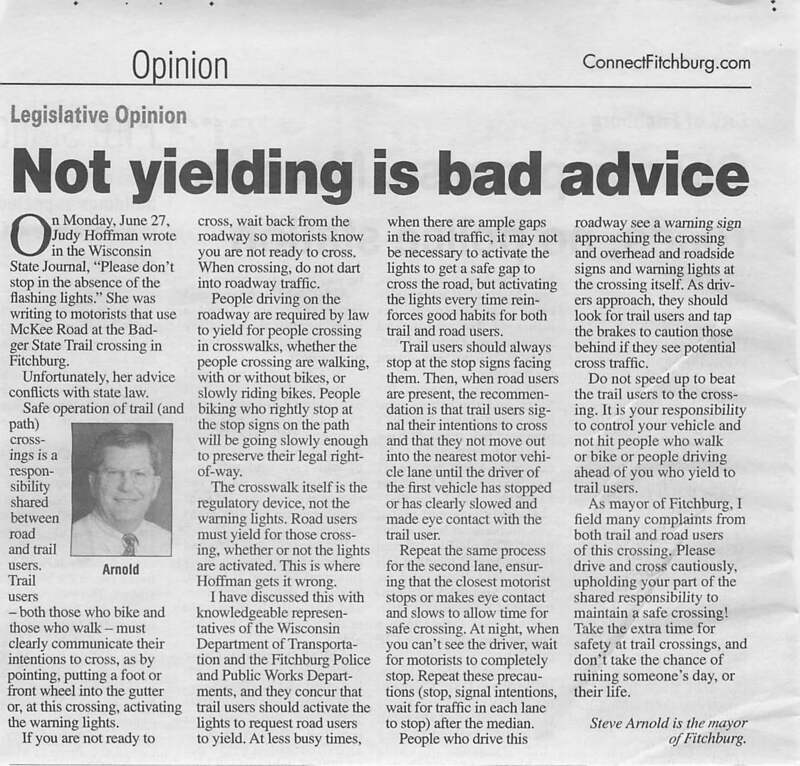 In the August 2016 Fitchburg Star (article produced below), Mayor Steve Arnold wrote an opinion informing people that Wisconsin law requires drivers to yield to pedestrians and bicyclists in crosswalks. Apparently a woman named Judy Hoffman wrote a letter to Wisconsin State Journal telling people, "Please don't stop in the absence of the flashing lights," at the crossing of Badger State Trail and PD in Fitchburg. Hoffman's comments show all that is wrong with drivers in Wisconsin. She urges people to do the exact opposite of what they should do-stop their cars and trucks so that people who are walking and bicyclists may use the roadway to cross. This is the sole purpose of a crosswalk. If people were only to stop for walkers and bicyclists when yellow lights flash, there would be no need for crosswalks. I am not sure why someone would encourage people to not stop for pedestrians and bicyclists. I have not been able to find a copy of Hoffman's article. I can only imagine that she is concerned that so many drivers these days are distracted when they drive and if a person stops for a pedestrian or bicyclist the person who stops in his or her truck might get rear ended. 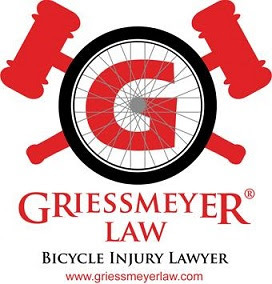 Instead of fear of rear-ender from distracted driver, people should follow the law-don't drive distracted, and do stop anytime you see a pedestrian or bicyclist anywhere near a crosswalk. 346.24 Crossing at uncontrolled intersection or crosswalk. (1) At an intersection or crosswalk where traffic is not controlled by traffic control signals or by a traffic officer, the operator of a vehicle shall yield the right-of-way to a pedestrian, or to a person riding a bicycle or electric personal assistive mobility device in a manner which is consistent with the safe use of the crosswalk by pedestrians, who is crossing the highway within a marked or unmarked crosswalk.